The EM-Gold’s combination of EM-Silver and EM-Red transformers make for the perfect sounding floor tom. It’s also the preamp you should reach for when you want that speaker-moving, low-mid thump from heavy guitars. The EM-Gold is ideal for fattening up thin-sounding sources; on mics lacking low mids or upper bass warmth; and mid transients, such as percussion and drums. It also shines on vocals, bass, and even drum machines. If you’re going to move air (the secret of a big sound), go for the Gold—the A-Designs Audio EM-Gold. The A-Designs Audio 500 Series comprises the four 500 series-compatible preamps, including the P-1, EM-Blue, EM-Silver, EM-Gold, and EM-Red, each specially voiced with a specific task or sound in mind. Also a highly respected member of this exclusive family is the EM-PEQ, a Pultec-style equalizer designed to bring the sonic dessert to your lunchbox. These units are not only a perfect fit for an API “lunchbox” physically, they also meet the precise power rating requirements necessary to function perfectly from the moment you plug them in. * To further guarantee that your A-Designs 500 modules work out of the box, A-Designs is one of a very few manufacturers that make their own 500-Series powered rack: the A-Designs Audio 500HR. To give each preamp in the A-Designs Audio EM-Series its own unique character, each has custom-wound transformers that employ proprietary A-Designs alloys that have been ear-tested to produce just the right sound for the right application. 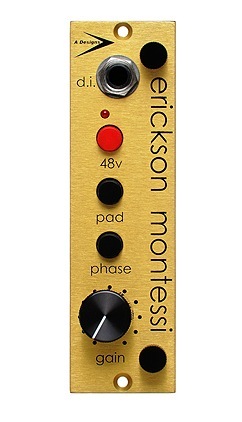 But that doesn’t mean that the EM-Series preamps are one-trick ponies—far from it. What it does mean is that decades of collective experience between A-Designs Audio and highly respected audio professionals who beta test A-Designs products have taken guesswork out of finding the right preamp for the job. Think of each of the EM series preamps as the ruler of a specific domain in the frequency spectrum. For example, the EM-Silver rules the lower frequencies thanks to its steel-wound transformer, making it a perfect choice for bass or kick drum, while the EM-Blue’s nickel transformer provides the clarity and highs needed to bring out the “crack” on snare drums. With various combinations of EM-Series modules you can create a lunchbox dedicated to recording drums, channel strips with Pultec-style EQ, or simply have a preamp for all seasons in one convenient location. Let A-Designs Audio’s EM-Series 500 modules be to be your guide to a world of color and sound that will inspire both you and your recordings.